This is the first in a series of three postings about the controversial “Stuttgart 21” project. Part two will be posted on Tuesday and part three on Thursday. I have been in Stuttgart for one difficult week. In the space of that time, I have been stripped of my illusions about transport-utopia and forced to confront my conflicting feelings about activism, identity and social change. Things got weird even before I arrived. I left Paris on Monday morning via the TGV, the fastest train in Europe, chasing a snowstorm east. The storm had dusted Paris but seemed to be gathering strength as it moved inland. Here’s one thing about high speed rail I never considered: if you’re following a storm, chances are your train is moving faster than the storm, so you’re gonna catch up with it and then get stuck in it – which is exactly what happened. As we approached the German border, the snow got heavier and our train slowed to a crawl. Hours and missed connections and drippy, standing-room-only train rides later I arrived in Stuttgart’s central train station. When I stepped off onto the platform I was greeted by a wall of blowing snow and angry people protesting the construction of a new train station. Welcome to Germany. Now, don’t think I was predestined to have a bad time in Germany. Quite the opposite, in fact. German is the foreign language I speak best, thanks to my arbitrary decision as a seventh-grader to study German, which I continued with right on through high school. When I travel, I always seem to end up hanging out with Germans. One summer I even worked at a German-owned dude ranch in Idaho, where I took a whole lot of German tourists on horseback rides through the Idaho wilderness. I love that the Green Party is an actual political force in Germany. I love that Germans are into trains and bikes and mountains and beer. Despite all this I’d never actually been to Germany, so maybe I was harboring some outsized expectations. I expected a wonderland of efficient trains, happy hikers and enlightened regional governance. Instead I found myself in the twilight zone of urban planning, where Greens protest train projects and the most powerful regional government in Germany has the highest VMT per capita in the nation. I chose Stuttgart as one of my case study regions because they have the first directly-elected regional government in Germany and are widely cited as a model for effective regional governance. Stuttgart also seemed particularly relevant for California because its a stronghold of car culture in Europe – Mercedes, Daimler and Porsche are all based in Stuttgart. Its not a transit utopia like Amsterdam or Stockholm that would be impossible to achieve in most parts of California. So I was prepared for the fact that automobiles would be a more powerful force here. But I was not prepared for the deep divisiveness and violent protest – from the left – over a project designed to improve transit service and regenerate a brownfield site in the center of the city. The project in question is called “Stuttgart 21” and it is a massive undertaking to modernize the central train station and surrounding rail network, build a new system of railroad tunnels beneath the city, and convert the existing railyard into a new, mixed-use neighborhood in the city center. Sounds great right? Well tell that to the thousands of residents and Green party leaders who have been staging protests against the project on a regular basis for months. Protests began in early Spring, just as construction was getting underway. The protests grew larger and larger over the course of the summer, with groups of protestors moving in to tree-sit in the park adjacent to the station. One day in September, when crews were slated to cut down approximately 25 trees next to the station, the protests culminated in a violent clash between protesters and police. 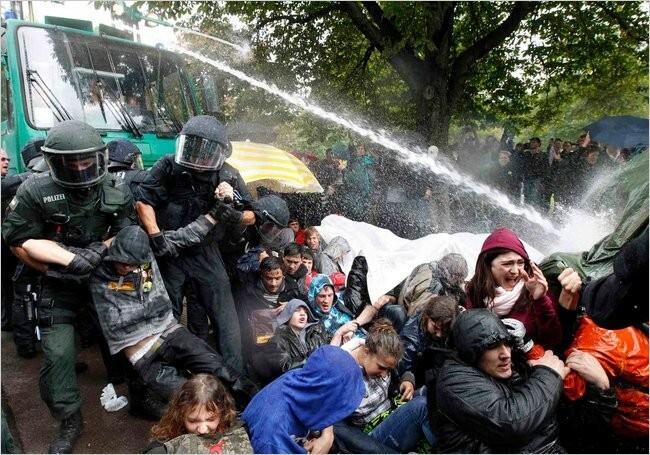 The police used pepper spray and water cannons on the crowd of thousands, injuring hundreds of people. Images of bloodied protestors made it into newspapers and TVs across Europe and sent shockwaves through the political establishment. 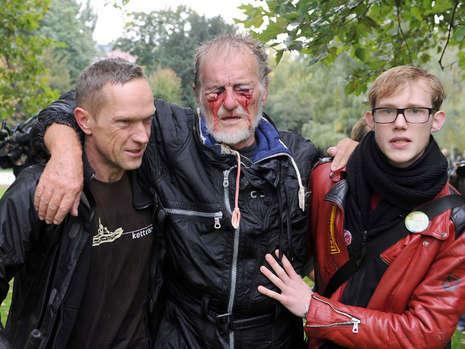 A protestor injured by water cannons in September was permanently blinded in one eye. This image has become the iconic photo of the Stuttgart 21 movement. Photo courtesy of Das Bild. After this episode construction was temporarily halted and mediator was brought in by the central government to try to calm things down, but the protests continue. I’ve encountered four protests since I arrived, and that’s without even trying. The largest I’ve seen was last Saturday, when I encountered two thousand protestors walking in a ring around the downtown. Today’s newspaper reported that four people were injured and one woman went to the hospital on Saturday after clashing with police. About 2000 protestors gathered outside the central train station on Saturday. Photo by me. All this over a train station? How is it possible that this could happen in Germany, the shining beacon of sustainable transport? As an outsider and an activist, I find it confusing and troubling to witness this conflict. While I didn’t come to Stuttgart with the intention of focusing on this project, it raises so many difficult and uncomfortable questions that I feel I have to explore. How do we evaluate the tradeoffs between localized impacts and global benefits? At what point do the costs of massive new infrastructure outweigh the benefits? What does it mean when smart growth goes mainstream in California, as it has in Germany? How can we create truly effective public participation in large-scale regional decision-making to avoid these kinds of conflicts? Tomorrow, in Part II, I’ll share some details about the project, some encounters with the protestors, and my own feelings in reaction to this quagmire. In Part III, I’ll do my best to explore some of these difficult issues. There are of course no easy answers, but this is a unique opportunity to be a fly on the wall (fence?) of someone else’s backyard. How intense. So – what is the contention over the train station? Is it just the trees? Other local impacts? Look forward to next installment. These were some graphic photos. Nice report, Autumn. Why is Stuttgart 21 bein g protested? Cost? Fear of change? Looking forward to the next two installments. Wow. How weird and sad. I’m on the edge of seat to read your post tomorrow. The stories you’re covering are just fascinating. 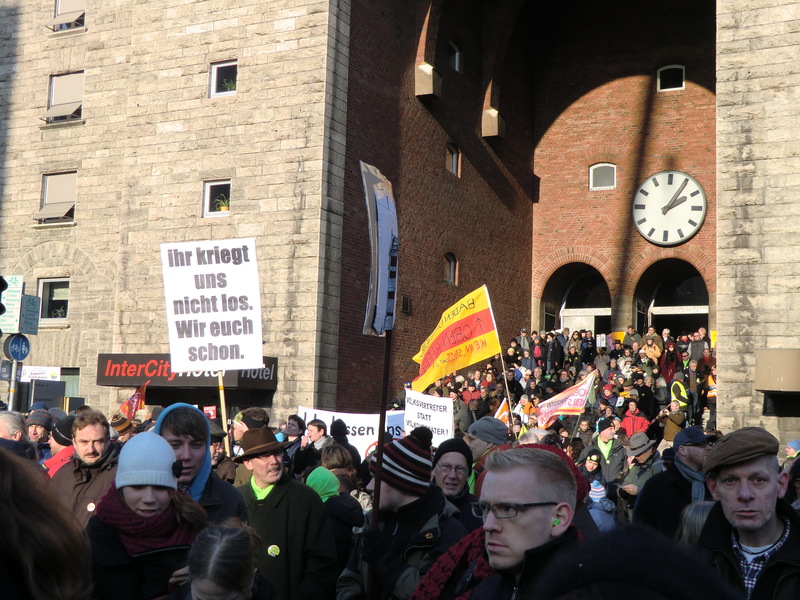 I’m guessing in Stuttgart the protesters feel they’ve been marginalized and their NIMBY concerns not addressed? But w/ regional gov’t and the Greens being more mainstream there, I’m also guessing the concerns were addressed at some point? So what gives? !